The first day started early. We were already out the door and en route to SeaTac airport by 4:30 am. My usual laissez-faire attitude toward arrival protocol was absent, thanks to a lack of sleep, an excess of political tumult and the usual anxiety that accompanies leaving your life behind for three months to travel around the world. We arrived in Los Angeles and headed to the wrong car rental location–no worries, Kenisha helped us out anyway–collected our our jeep –sweet upgrade, thanks Francisco–and headed to the hills. 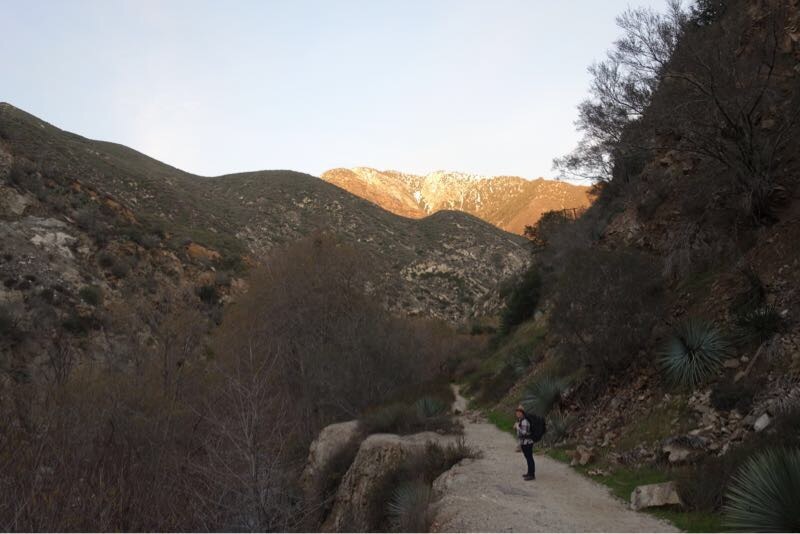 Since we’ll be traveling in summer climes, we figured it would be best to test out our gear in the San Gabriel wilderness. After a few wrong turns, we set off on a little-known ten-mile backpacking trek with the ominous final destination of The Bridge to Nowhere. Fasforward approximately six hours. It’s now dark. I’m perched on the side of a cliff with a twenty five pound pack, balancing another against my left knee. My legs have cuts from the assortment of razor-sharp yuca plants and twigs I encountered as we scrambled around in the twilight. My feet are soaked from fording a river that had much more water than expected. Congratulations on your ebbing drought, California. I watch as Tiffanie clambers up a rock face, flashlight in mouth, to see if the trail we’ve lost is on the other side. Obviously, we need a headlamp. We ended up calling it a night and setting up camp on a beautiful slab of rock overlooking a winding valley. Think pride rock from The Lion King, minus scar and add fifty gigantic mountains. Okay, so it wasn’t really like pride rock, but you get the idea. As we set up our tent, we discovered that our kit was missing stakes. One more thing for the list. Thankfully, we remembered the tequila, which helped soothe our aching muscles and injured egos.